Harmed in the hospital? Should you sue? Ryan and Leah Jeffers filed a lawsuit against Sacramento's Methodist Hospital, alleging malpractice for their daughter, Malyia. (CNN) -- Ryan Jeffers finds it hard to believe his daughter, Malyia, went from being a perfectly healthy 2-year-old who loved to dance, sing and entertain to an amputee facing a lifetime of medical care. "I can't believe something so small turned into something so big," recalls Jeffers, who noticed that his daughter had a fever one Sunday in November. Malyia's fever continued to climb, and unusual bruises appeared on her cheek; her parents say they rushed her to the emergency room near their Sacramento home. But things did not go as they expected. The family says that they couldn't get a physician to examine Malyia and that the five-hour wait in the emergency room nearly killed her. Her septic infection worsened as she waited to be seen. "If any of my other kids get sick, I'm terrified about taking them to the ER," says Jeffers, who recalls watching his daughter deteriorate in his arms. She ultimately needed several amputations, which the family feels could have been prevented. In February, the Jefferses filed a lawsuit against Sacramento's Methodist Hospital alleging medical malpractice and negligent infliction of shock and emotional distress. "The day this happened, I knew I wanted to sue," says Jeffers, who waited until his daughter was stable before contacting an attorney. "No one's child should have to suffer the way Malyia did in that ER," he says. "We are profoundly distressed by what happened to Malyia Jeffers. The care of our patients is our highest priority. We triage and treat thousands of patients every year. While federal privacy laws limit our ability to comment on specific cases, we have been in contact with her family and are working toward a resolution to support their needs. She and her family remain in our thoughts and prayers." Moseley Collins, a Sacramento-based personal injury attorney, says that when he was approached about representing the family, the story immediately registered on his radar. "There was a horrible outcome, and it had a 'wow-that should-have-never-happened' factor," he says. "A hospital emergency room is never allowed to delay treatment so long that it catastrophically injures the patient; that's a rule of patient safety," Collins explains. He says the hospital has asked for mediation in Malyia Jeffers' case, which is scheduled for May 24. Collins says he didn't hesitate to represent Jeffers, but not every case is as easy to decide. He and other experienced malpractice attorneys say they tend to be very judicious about what they pursue. According to the Kaiser Family Foundation, 10,739 medical malpractice claims were paid in 2009 out of the more than 85,000 suits filed annually. Statistics from the U.S. Bureau of Justice show that plaintiffs won less than a quarter of the trials, and on average plaintiffs received $400,000. "Some say there are lots of frivolous lawsuits, but lawyers would be fools to take on a frivolous case," says Barry Furrow, director of the Health Law Program at the Earle Mack School of Law at Drexel University. Furrow says attorneys can spend hundreds of thousands of dollars on discovery fees -- the costs of gathering facts and evidence to support claims -- but in the end, they earn only a percentage of the winnings. To make prudent investments, they tend to focus on cases with huge losses. Malpractice is not about bad results; it's about bad conduct by medical professionals. Not to mention, even cases that seem obvious can be difficult to prove. The attorney must establish that the physician violated or fell below the standard of care -- a term used to refer to the care anyone with a particular illness would receive based on commonly accepted practices -- and that the breach caused ongoing damages, says Dr. Jeff Segal, a neurosurgeon and founder of Medical Justice, a group that helps physicians prevent frivolous lawsuits. During the discovery process, the legal team seeks the expertise of physicians, nurses and hospital staff willing to acknowledge something went terribly wrong and that the error negatively affected the patient's health. "If there are no damages, there's absolutely no case," Segal explains. So, how do you know if you have a good case? "The idea that medical malpractice is free money for unhappy patients is wrong," says Jeffrey Toobin, CNN senior legal analyst. "Malpractice is not about bad results; it's about bad conduct by medical professionals," he says. "Not everyone recovers or gets as well as they like it to be, but that alone is not justification for a lawsuit," Toobin adds. A 2006 study from the Harvard School of Public Health found that claims that lack evidence are common, but most are denied compensation. Still, there has been growth over time in the economic component of malpractice awards, which has an impact on the system as a whole. According to a Government Accountability Report, the rising cost of medical malpractice insurance premiums has caused physicians to move or close practices, reduce high-risk services or practice defensive medicine, altering their practices to avoid potential lawsuits. Experts say helping patients distinguish when to sue and when not to sue can help keep costs down for everyone. So, how do you know if you have a good case? "If, in spite of the horrible professional action, you did just fine, the threshold is low," Segal says. "If an error occurred during surgery, sure, it could have been prevented. But if the patient wakes up, is healthy and marches off into the horizon, that's not a good case," he says. Similarly, "something that could have happened but ultimately didn't is not going to stand up in court," notes Collins. "If a doctor misses something, you have to ask yourself: 'What difference did it make?' " he says. If you're not worse off now, then you haven't really been harmed. A stronger case: If you require expensive, ongoing care as a result of your injuries, that's a good sign you may have a case. "If you lost an arm, had a stroke or died, those are seen as significant damages and the threshold goes up," Segal explains. "If you have a collection of issues that can make your underlying problem worse or can independently cause the problem, that increases the total risk for the patient," Segal says. For example, if you are undergoing a procedure to repair a fracture but you are obese and smoke, there is a higher likelihood the fracture won't heal than if you are a thin non-smoker. A stronger case: Attorneys say a healthy person undergoing a low-risk surgical procedure that results in permanent damage or even death might be cause for further investigation. If your doctor was rude or did not have a good bedside manner, that is subjective and would not count as substandard care. "You need something that's pretty clear," Collins advises, "something where you think 'that should NEVER have happened.' "
A stronger case: Collins says the Jefferses' case is strong. Court documents allege "the parents of Malyia repeatedly asked and begged defendants (the ER staff) to treat their daughter. ... The defendants chose not to do so and instructed the family to continue waiting," and that "as a direct result of the defendants negligence, Malyia Jeffers suffered quadruple amputations of both her feet, her left hand, and all the fingers on her right hand." Before undergoing a medical procedure, patients sign informed consent, a communication that outlines all of the risks and benefits of the proposed treatment. This sample consent form details the risks associated with donating part of your liver and notes that the most common complication is a bile leak, which occurs during about 5% to 15% of these surgeries. Bile leak complications would fall within the acceptable risks. A stronger case: "If you developed the bile leak, complained of abdominal pain and developed a fever, and in spite of calling your doctor's attention to the problems, he took no action," that would be considered an unacceptable risk, says Segal. "The delayed diagnosis of a treatable complication would qualify as actionable." A previous Empowered Patient -- Should I Sue My Doctor -- took a look at a situation where a patient was injured during a hysterectomy but the complications were considered within the acceptable risks for the surgery. "Sometimes, when people are angry, they use litigation as a way to figure out what happened," Segal says. "I'd recommend the patient meet directly with the doctor and say, 'I'm not happy with the results' and to try to clear up any uncertainty through communication." He says physicians generally want to avoid lawsuits, and often patients want answers, not money. A stronger case: If something goes profoundly wrong and the physician fails to communicate or acknowledge the issue, patients sometimes want to see that someone is working to fix the problem and prevent it from happening again, Furrow says. "The more money a hospital or physician has to pay out, the more they worry, and the more they aim to make sure it doesn't happen again," he said. If you'd like to contact an attorney to find out whether your situation would qualify, Lawyers.com and the American Board of Professional Liability Attorneys allow you to search for medical malpractice attorneys in your area. Note that many states have caps on rewards for pain and suffering; the National Conference of State Legislatures and MedicalMalpractice.com have each compiled a list detailing the laws in many states. Even if you move forward, keep in mind there are some consequences. First, once you sue your doctor, your relationship with him or her effectively ends, attorneys say. Be sure the damages are big enough to make that move. The family's attorney says he is considering the ongoing care Malyia will need. Also, be prepared for a long haul. "The experience of going to court, even if it is ultimately successful, is extraordinarily draining," Toobin says. "Being in court can be a painful, lengthy and uncertain experience." Finally, losing can cost you. "Many people don't realize that if you try a case and lose, the doctor can ask the judge to make the plaintiff (you) pay for the cost of the defense," says Collins. This is an expense that can run into the tens of thousands of dollars. 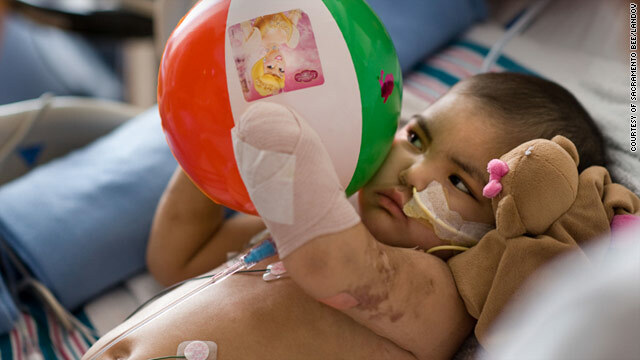 Malyia was transferred from Methodist Hospital in Sacramento to the Lucile Packard Children's Hospital at Stanford University, where she underwent her amputations and rehabilitation earlier this year. She was discharged just over a week ago, and her parents say people can e-mail them to find out how she's doing or offer support. The family's attorney says he is considering the ongoing care Malyia will need: lost wages from her disability, a lifetime of prosthetics and potentially 24-hour care. The cost of taking care of her over the course of her lifetime could reach into the millions, he says. But, he says he has one other altruistic motivation for accepting the case: "I'm hoping doctors and nurses all over the country will want to go check their emergency room to make sure what happened to Malyia Jeffers doesn't happen in their facility," Collins says. "So we're improving care for children all over country."